Pictured is Michaud Residential Health Services Maintenance Director Jon Bergene as he puts some of the finishing touches on a renovation and remodeling project nearing completion at the skilled nursing and short-stay rehabilitation residence in Fulton. FULTON – Michaud Residential Health Services in Fulton is nearing completion of a two month long re-modeling project that saw a number of updates to resident rooms and commons areas. The updates ran from the cosmetic (new paint, etc.) to more substantial – new molding, window treatments and other fixtures that served to enhance the “curb appeal” and functionality of each room. Other improvements that are being made include updates to the cable television wiring throughout the residence and some additions of artwork and other decorative fixtures that make for a more homelike atmosphere. 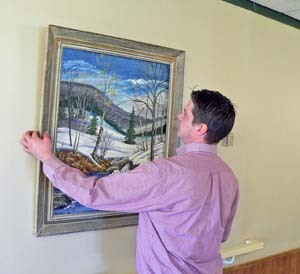 Toczek noted that anyone exploring long-term care or short stay rehabilitation services is welcome to arrange a visit to tour the residence and discuss the services that are offered by the dedicated and knowledgeable Michaud staff. For information, or to arrange a tour, call Michaud Residential Health Services at 592-2009. Information is also available on the web at www.michaudhs.com.